1. 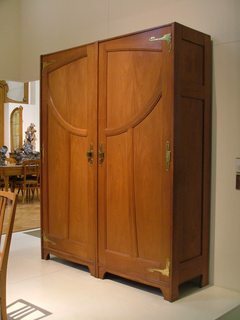 A tall cupboard or wardrobe with a door, used for storage. 1. A large, tall cupboard or recess in which clothes may be hung or stored. I do not live in the US nor in the UK but I would like to know whether Americans ever use the word "wardrobe", in the sense of furniture, instead of closet. Similarly, if both terms are derived from Middle English, and both are French loanwords why did "closet" catch on in the States but not in the UK? For example, was the term "closet" more commonly used in England at the time when the Pilgrims left Plymouth and boarded the Mayflower in 1620? Has the meaning or its usage changed in the last fifty years, etc.? I am not interested so much in the different meanings and idiomatic usages of closet and wardrobe, but as to why one term for a piece of bedroom furniture was preferred to the other. TL;DR: The term "closet" shows up much more in American writing and speech because closets (the architectural feature) are much more common than wardrobes (the piece of furniture) in American homes, and have been for a century or more. I agree with GEdgar's answer that in the US, a closet is an architectural feature—essentially a small room (possibly very small)—whereas a wardrobe is a piece of furniture (or possibly the collection of clothes that can be held in either).1 In my experience, the terms are not generally used interchangeably for either the built-in home feature or the casegood, though I can imagine that in a pinch someone who couldn't bring to mind the appropriate word for a piece of furniture might call it a "closet thing" or similar. Update the inside of your closet or create extra storage space with the Honey-Can-Do freestanding wardrobe closet. This portable system keeps clothes, shoes and other items organized. Thus the word closet is not really preferred over wardrobe in the US in the sense of having replaced it as the "correct" term—both terms are still in common use by most adult AmE speakers, just for two different concepts. However, the word "closet" is, indeed, far more common in American speech and writing. 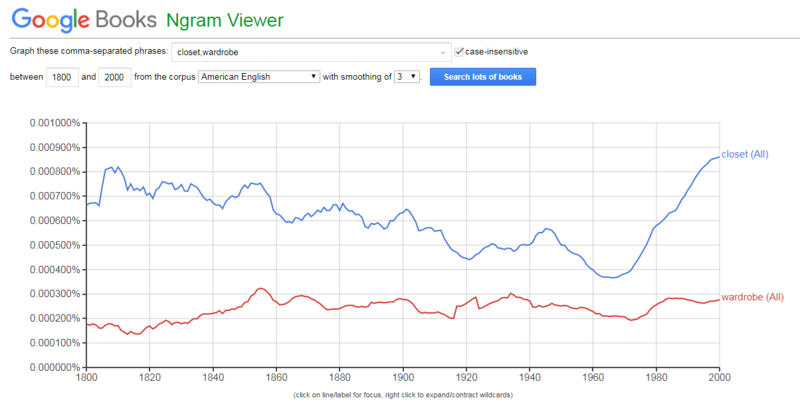 For example, a Google Ngram comparing "closet" and "wardrobe" (case insensitive; typical Ngram caveats apply) shows that as of 2000, the term "closet" was almost three times as common as "wardrobe" in Ngram's American English corpus. In fact, "closet" has been more common than "wardrobe" in American English writing for over two centuries. The usage of "wardrobe" held fairly steady from 1800–2000, whereas "closet" gradually declined to the mid-1960s and then began a fairly steep rise. The reason for this disparity has to do with architectural history: in the US, built-in clothing storage, AKA closets, are virtually ubiquitous, and have been for a very long time. This means that there is less need for furniture in which to hang clothes. So we talk about closets more than about wardrobes, because we have more closets than we do wardrobes. 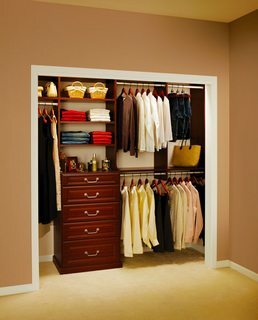 In general, regular closets are 3 by 5 feet, while walk-in closets are 5 by 8 feet . . . . But the timeline also highlights a couple of "closets" that look more like entire rooms or even boutiques, the new aspirational closet (full disclosure: I converted a small second kitchen in my 1900 farmhouse into a "sleep-in" closet, complete with its own closet, though the contents are nothing like as luxe as Carey's/Carrie's). In parts of the US where space is at less of a premium, closets have been common for even longer. A couple of articles on the history of Iowa home architecture6 show small closets in homes built as early as the mid-1800s, and common for houses built by the end of that century. And modern homes in the US are expected to have a closet in every bedroom (even if that's not usually a legal requirement). So you've found the perfect apartment, with great light, in a great neighborhood, only — it doesn't have any closets. You could throw away all of your clothes, or, if wearing the same outfit for the rest of your life sounds like too much of a sacrifice, you could check out some of these ideas . . . . Note the dramatic pause (punctuationally speaking) introducing the desperate lack of closets. An antique armoire can bring a sense of timeless elegance to any home, but not everyone can find a proper use for one — not to mention sufficient space too! In the old days they were used to store clothing and linens back when bedrooms didn’t have closets, and today some people use them to hold their televisions — but that trend perhaps isn’t as big of a deal as it once was now that TV screens are so flat and compact. In any case, if you do have the room for it, i[t] certainly isn’t impossible to find some kind of use for an armoire. 1 The piece of furniture is also sometimes called an armoire, and if it is combined with a chest of drawers it may be called a chiffarobe. I'm sure there are other terms in regional use, too—possibly even closet. I note that even Merriam-Webster lists "a cabinet or recess" as a possible meaning of closet, so it's likely that someone in the US says this or did at one time, but it is far from common now. but a closet is built in to the house. A closet may have doors, unlike this one. As a child, when I read The Lion, the Witch, and the Wardrobe, I imagined something like the first picture. I wonder if kids in England imagine something like the second picture? Not the answer you're looking for? Browse other questions tagged word-usage american-english british-english transatlantic-differences or ask your own question. Is checklist or tick box (or something else) more common in British English? What is more common: harbour or port?